Negative energies affect people and cause them distress with their subtle black energy. Black energy can create a variety of problems such as depression, unclear thinking or malfunction of an organ which can lead to even further difficulties such as addiction, financial problems or chest pain respectively. The Salt Water Spiritual Remedy is a simple but effective remedy that drains black energy from the body. Many seekers around the world have experienced marked improvements in the quality of their lives and spiritual practice by including the salt water remedy in their spiritual healing regimen. 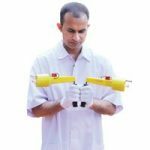 The Maharshi University of Spirituality conducted an experiment using the Universal Thermo Scanner (UTS) to study the subtle effects of performing the Salt Water Remedy. The purpose of the experiment was to study the effect of the Salt Water Remedy on a seeker who was suffering from severe spiritual distress. The subject’s readings were taken before and after carrying out the Salt Water Remedy using the Universal Thermo Scanner (UTS). The Salt Water Remedy was done for 15 minutes in lukewarm water. The experiment was conducted on 25-December-2016 at the Spiritual Research Centre and Ashram in Goa, India. The UTS instrument allows one to measure 4 types of energies emitted by a subject. The readings of the seeker (who is afflicted with spiritual distress) were taken before and after the Salt Water Remedy was performed. The readings are listed below for all the 4 types of subtle energies. Only if the 2 arms of the scanner open out to a full 180 degrees, then only can the distance of the aura of that aspect be measured. If the arms of the scanner are less than 180 degrees, then it means that there is no aura in relation to that aspect. To capture the total measured aura, a small sample of the subject (to be measured) is required to be inserted into the UTS. In this case, we used some saliva from the subject’s mouth. There are some remarkable differences in the readings before and after the Salt Water Remedy. The Infrared energy reading which denotes negative energy distress reduced from 180° to nil. This is a considerable positive change resulting from a spiritual remedy that lasted just 15 minutes. This means that this aspect of the negative energy reading was nullified. 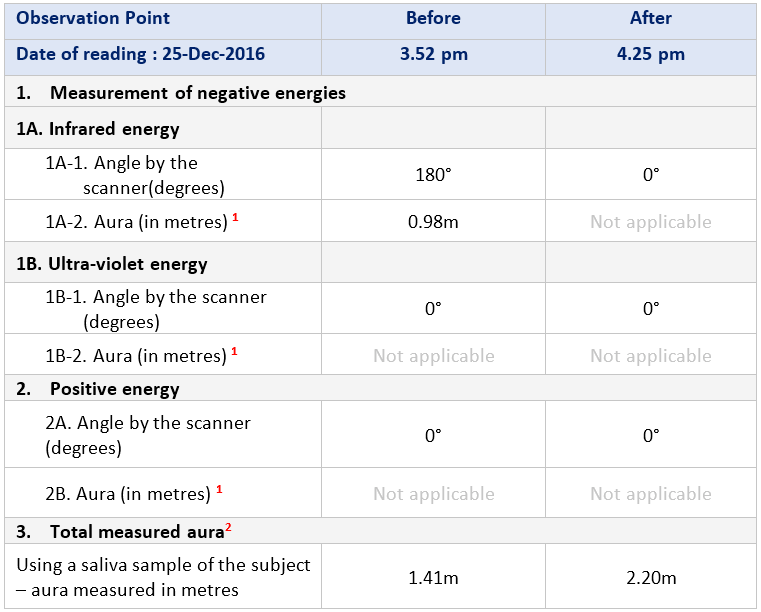 The total measured aura reading also increased by over 55% from 1.41m to 2.20m, which is a positive sign and demonstrates the effectiveness of the remedy. This experiment along with the testimonials from hundreds of seekers who felt better after the remedy shows the efficacy of Salt Water Remedy as a natural way to reduce subtle black energy and distressing vibrations (which are Raja-Tama in nature) from the body. We appeal to scientists who are interested in carrying out further research on the Salt Water Remedy to contact us using our contact form. What is the Salt Water Remedy?